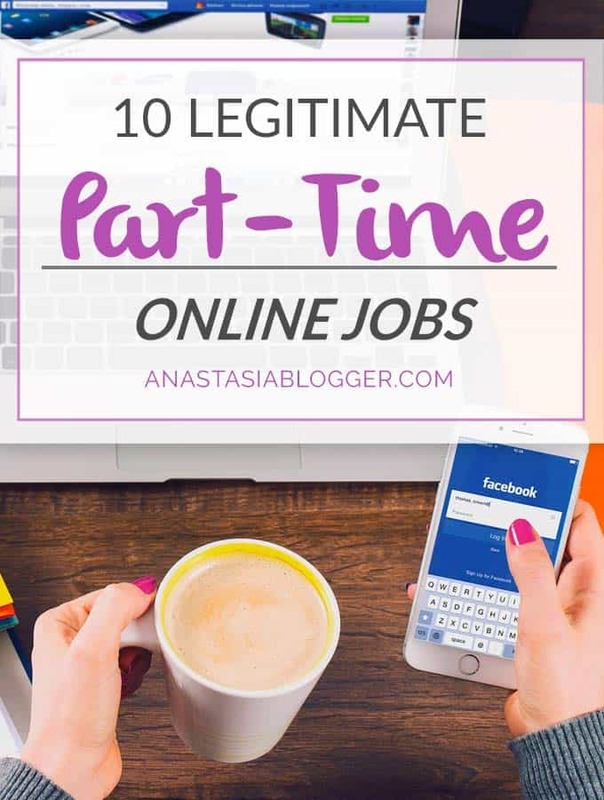 10 Part-Time Online Jobs - Start Making Money at Home! I know that many of my readers are stay-at-home parents with lots of household responsibilities, part-time online jobs or side hustles for a few hours a day are a way to distract from the daily routine and still a source of extra money. Another part of my readers work 9-5 full time but would like to have a side hustle. Part-time jobs can later become your primary income if you fall in love with the job or choose to develop your skills and expertise in that area further. Since for me part-time online jobs have been a great support for many years, I’d like to share with you some company names that regularly offer jobs with flexible working hours. I actually went to each of these sites and registered to see whether they are currently hiring and what they can offer. 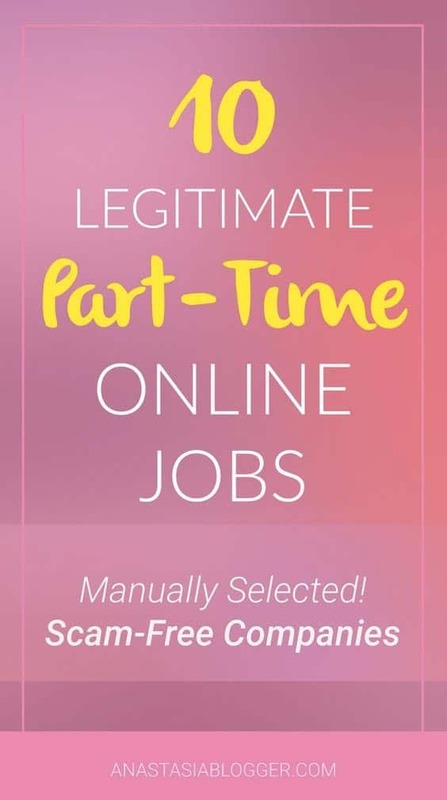 I intentionally included in this list various types of online part-time jobs – from data entry jobs, transcribers to virtual assistants. The jobs in this list are required on average a commitment for 20 hours per week and are paid $10-15/hour. A crowdsourcing company recruiting people around the world for part-time online jobs like internet assessor, search engine evaluator, rarely for Software Testers. They open positions in different countries from time to time, so you need to check their openings to see if there is something available in your country. Most of the web research positions are for maximum 20 hours per week and the hours are flexible, you can choose to work even in the night if you want to. Check details and apply for jobs on Lionbridge here. Appen offers online part-time jobs like home social media evaluators, translation, data annotation, web research. Roles like Social Media Evaluator usually require a few hours of work per week. Check their location search and start working online from where you live! Check details and apply for jobs on Appen here. If you are confident in working as a customer service representative, personal assistant, and admin, you should try to apply for a job as a Virtual Assistant. Worldwide101 pays €14-16/hour with a maximum of 25 hours a week. For this job, you have to be available during the regular business hours. Check details and apply for jobs on Woldwide 101 here. If you are good in research, try to apply for jobs on Wonder Researcher. This company recruits online researchers for doing general research, paying $15-25/hour depending on the topic of research and on how fast you complete the task. You’ll be asked to pass an assessment to join the team of researchers (don’t worry, it’s just 4 questions and will take you max 10 min), within the next 7 days indicating whether you’ve been advanced to the next stage of the process. Check details and apply for jobs on Wonder here. Members receive $5 just for joining! Swagbucks is known for giving out fun, top-paying surveys. And you can also get paid to play games and watch TV! And yes, you are paid in cash via PayPal! iSoftStone is another organization offering a broad range of positions, including search rater, transcriber, helpdesk technician, annotator, etc. This company offers part-time flexible hours with a chance of getting more work depending on the quality. Check details and apply for jobs on iSoftStone here. Another crowdsourcing company that recruits search quality assessors for a maximum of 20 hours a week in many countries like USA, Canada, Brazil, Spain, India, Portugal, etc. You’ll have to pass their test to qualify for this job. Check details and apply for jobs on Leapforce here. This company offers only freelance transcriber jobs with flexible hours. If you have excellent typing skills and have no problem with comprehension of American/British/Australian/Indian accents, you should definitely give it a try! Check details and apply for jobs on Scribie here. This is a call center company that hires only residents of the US. The positions are mostly for customer service, with a minimum of 20-25 working hours per week. It’s a great part-time option with benefits. Check details and apply for jobs on Alpine Access here. You can work for this company from anywhere, the jobs they offer are of text creation, editing, web research, data tagging, data categorization, etc. They don’t require experience for these positions, the hours are very flexible. Check details and apply for jobs on Clickworker Access here. This company offers positions in telephone mystery shopping for 10-30 working hours a week or more. You’ll have to pass a test before getting the job. Mystery shopping implies that you call businesses and find out about pricing and other details. This is a great extra income option. Check details and apply for jobs on InteliCheck here. This list is definitely not the fullest collection of the companies that could offer you part-time jobs from home, but you can feel safe with these companies, these are not scams. I did a manual check on each one of them, went through the application process to see what are the positions, how flexible are the hours and what is the average hourly rate you get. I’m going to update this article if any of these companies stop hiring for part-time jobs from home. Besides working for some companies, you could choose a part-time online job of your own – for example, to start a blog on WordPress can take you 10 minutes! Follow my link for the step-by-step guide through this process, and bring you money consistently, with time it can even become your primary income source! I know english typing only. I am interested to work online captcha typing jobs. online just typing jobs. My english typewriting speed is normally 2o to 30 words per minute. accuracy is 80 to 90 percent. I offer my self as a candidate english captcha typist online or english typist job just english typewriting. thanks. I am working as a virtual assistant for an SEO company. I am currently working from home. Recently I have been searching for some more additional sources of income, and I found a new site because of you Anastasia. Thanks for this wonderful collection. This is a very helpful information. Though most of the sites mentioned herein are relatively new to me. Probably because of my location. Thank you for sharing such a valuable content. Hi Admin, I came across your article from Google when I was surfing the knowledge for online jobs from home. Really an interesting post on part-time online jobs. Today every people are in the search for secondary income to maintain a stable living in the world. Your post will help your blog visitors to find a second job to get a decent income every month. Thanks for sharing this post. Keep sharing some interesting postlike this with us. Hi Thiranya! Glad it is a helpful post! Hi, Thanks for the great list of jobs, I am sure this will be helpful for students, housewives, and job seekers to make money at home, I am going to suggest this type of jobs for my friends to get some knowledge, Nowadays its really hard to manage the monthly expenses so this will be best option to earn Income,keep doing this great work and keep sharing,Thank You.